2002's Perseverance was a perfectly executed, packed-with-anthems follow up that has become emblematic of the era. In fact, the album's iconic and lyrically uplifting track, "I Will Be Heard", has become the band's signature battle cry, securing its place as the quintessential, fist-in-the-air chant of the new millennium, thanks to a call-to-action that starts with "Now is the time for me to rise to my feet…"
Support for the tour is confirmed and will be announced in early September. Tickets go on sale on Friday, August 25. Tickets and VIP packages will be available HERE. 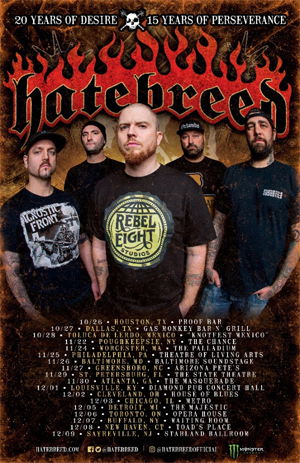 All Fall 2017 HATEBREED tour dates are below.